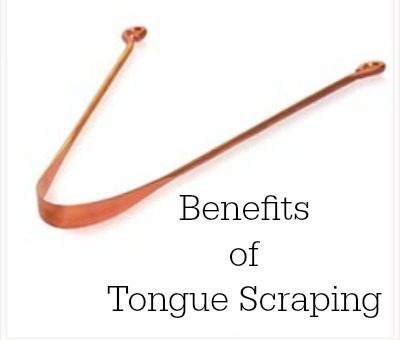 There are several benefits of tongue scraping to improve overall health. Benefits range from eliminating bad breath to boosting your immunity. You may have never heard of tongue scraping. I will share what it is, the type of tool you need, and the may benefits of tongue scraping with you. Tongue Scraping is an Ayurvedic self-care ritual. A tongue scraper is an oral hygiene device that is designed to clean the bacteria build-up, food debris, fungi, and dead cells from the surface of the tongue. The bacteria on fungi that grown on the tongue are related to many common oral care and general health problems. Oral hygiene and fresh breath are important to most people. People often think that killing all bacteria in the mouth is a good thing but it isn’t. This bacteria is a necessary part of our natural flora that needs to be kept in balance. This bacteria helps to protect against other potential issues. It is important to maintain good oral hygiene without wrecking havoc on our natural flora. I recommend using a tongue scraper every day. It is best to do this in the morning on an empty stomach. Simply hold the two ends of the tongue scraper in both hands, extend your tongue, and place the tongue scraper on the surface of the tongue as far back as is comfortable. Gently pull the tongue scraper down the tongue. It will remove the unwanted coating on your tongue. Rinse the scraper and repeat. I do this around 7 times each morning. Remember to be gentle so that you do not cause damage your tongue or taste buds! There are many types of tongue scrapers available. I use a copper tongue scraper. I purchase my tongue scrapers online here. I hope that you enjoy the benefits of tongue scraping as much as I do! This post is part of the Green & Natural Blog Party, check it out! This equally grosses me out and intrigues me. haha. I do love dry brushing though so am curious how many benefits I would get from this! I totally feel the same way but I love the benefits!